In a career lasting five decades, Graham Collier was a bassist, composer, bandleader, jazz educator and writer. He was also something of a trail-blazer: he was the first British jazz musician to attend Boston’s Berklee School of Music (1961); the first to receive an Arts Council grant (in 1967 for the composition of Workpoints and a two-date tour with a 12-piece band); the prime mover of the first full-time jazz degree course in the UK (at the Royal Academy of Music, 1987). Collier was also a lifelong advocate for the music, particularly in its European manifestation, tirelessly championing his view that jazz is a verb rather than a noun, that music finds its essence primarily in performance ("the musicians in front of you […] are important, not the rules, or even the notes that you have written," as he writes in his Dedication to his major work, The Jazz Composer, published by Northway in 2009). As both a subtle and profound theoretician and as a practitioner, he was constantly negotiating the often obscure paths between composition and improvisation, between respect for and knowledge of the music’s tradition and spontaneity, and progression between acknowledged influences (chief among them Miles Davis and Duke Ellington) and individuality. Moreover, Collier was something of an outsider: a man from a close-knit working family who operated outside traditional class boundaries; a gay man in what was often seen, especially in the 1960s and 1970s, as a somewhat macho environment; an individualist with a profound belief in freedom of expression who struggled all his life to bring jazz to the attention of the arts world, to establish the music alongside classical music, opera and ballet as an unquestioned equal rather than a raffish, poor relation. 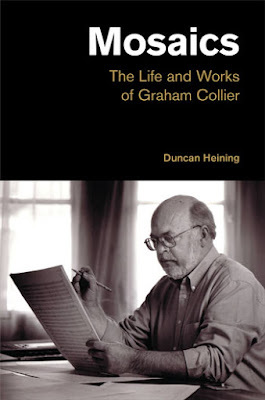 Faced with making sense of the life of such a complex individual, Duncan Heining has sensibly opted for a comprehensive rather than a partisan approach, painstakingly sifting through Collier’s own writings and compositions for clues to his sensibility and setting the resulting evidence dispassionately before the reader. Collier’s bandmembers (Chris Biscoe, Stan Sulzmann, John Marshall, etc.) are all extensively quoted; contemporary reviews of Collier’s major works are mined for their insight; letters to publishers and employers are quoted to illustrate Collier’s (often stubborn) belief in his own rights and deserts. Mosaics presents a fascinating picture of a rich, multi-faceted life. It readily acknowledges that Collier was often single-minded in his dedication to strongly held views and sometimes perhaps unwisely persistent in his pursuit of same, but more importantly (like its stablemates on Tubby Hayes and Stan Tracey), it provides a valuable celebration of the work and legacy of one of the UK’s most important and influential musical figures. Graham was a very gentle, intelligent man and, typically, he insisted on a lower case title for his book 'the jazz composer' (www.northwaybooks.com) as he did not want anyone to think that he was claiming exceptional importance as being The Jazz Composer. In spite of this modesty his views about jazz, as indicated by Chris Parker (above), were fiercely held. His mantra was ‘jazz happens in real time once’, and he was dismissive of imitation. The performances of his music were memorable: the compositions were carefully crafted and inspired, with generous space given to soloists but he held the view that ‘The real role of the soloist in jazz should be to illuminate the composition.’ He wished for ‘a wider appreciation of what jazz is, now,’ and hopefully there will now be a new appreciation of his work.